Over the weekend I was visiting my son again at his boarding school in the high country of South Carolina. 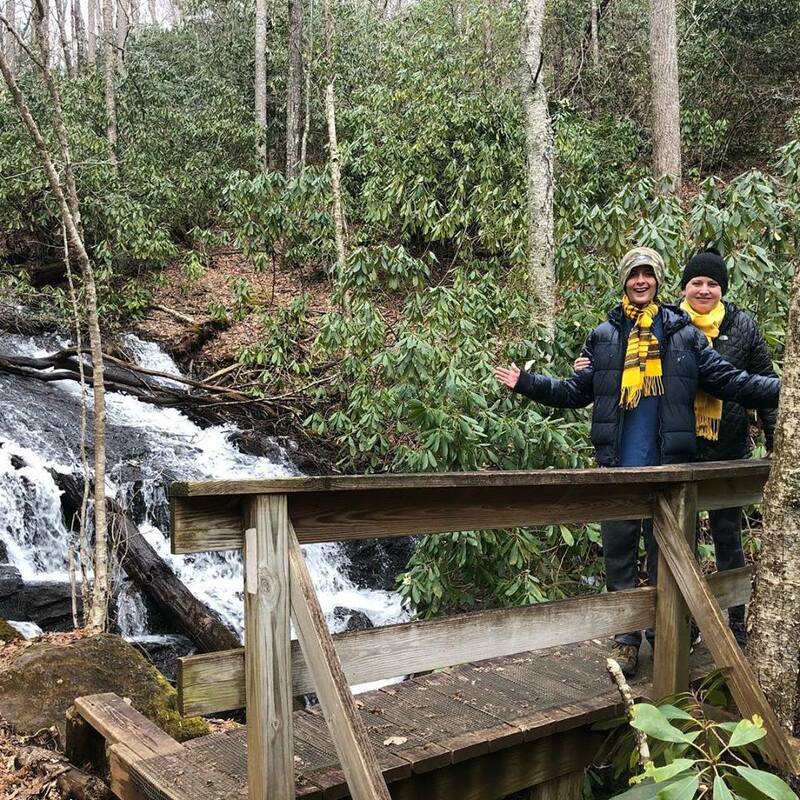 As is becoming tradition, we took advantage of the fact that it is so close to the Appalachian Trail, and made sure to fit in another hike. It was after all, a gorgeous day for a walk in the woods, and he’s expressed to me a few times now that he’d like to thru-hike with me one day. This news of course is a dream come true for me! So I have to feed that passion. His trail name is Jiffy Pop, in case you’re new here. 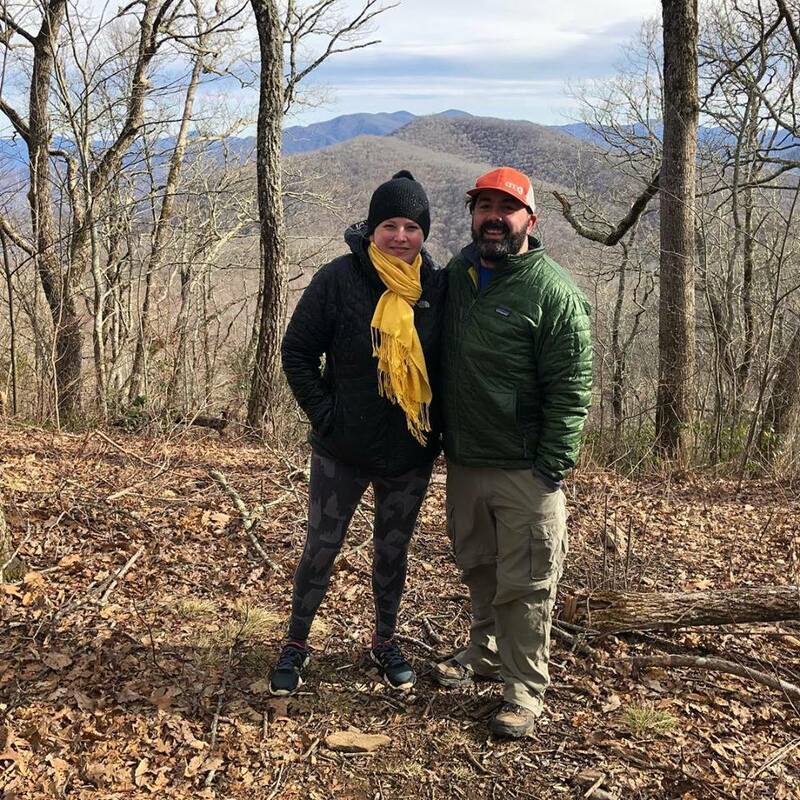 We were up in the Asheville, North Carolina for most of the weekend for other reasons, and I thought about finding some local trail hikes there. 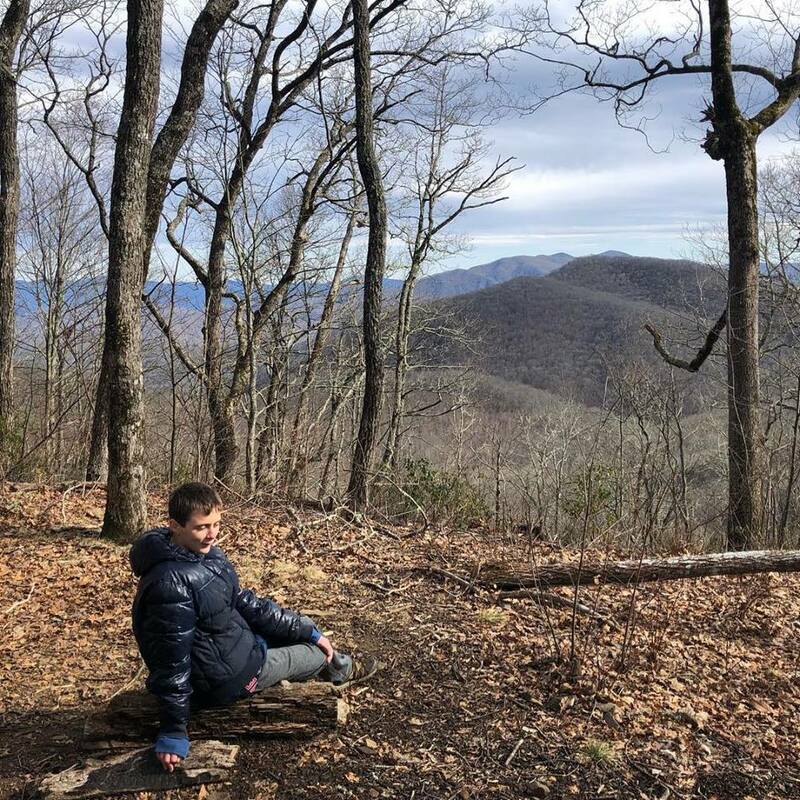 I know there are also great trails and hikes near his school in northwest South Carolina and northeast Georgia. However the Appalachian Trail was the trail I wanted to get him on to keep him excited about a thru-hike one day. So I thumbed through my WhiteBlaze 2019 white pages guide while at our hotel for options on the Appalachian Trail nearby in North Carolina. We did get to drive on the Blue Ridge Parkway, by chance, on the way to one of our activities. What a treat! It is very much like Skyline Drive in Shenandoah National Park, but starts just across the road from Skyline’s southern end in Waynesboro, Virginia and travels a few hundred miles south. It was a bit overcast and cloudy that day (Sunday) but was as a result also a perfect example of why these are called the Great Smoky Mountains. We stopped at an overlook and took some photos of course. 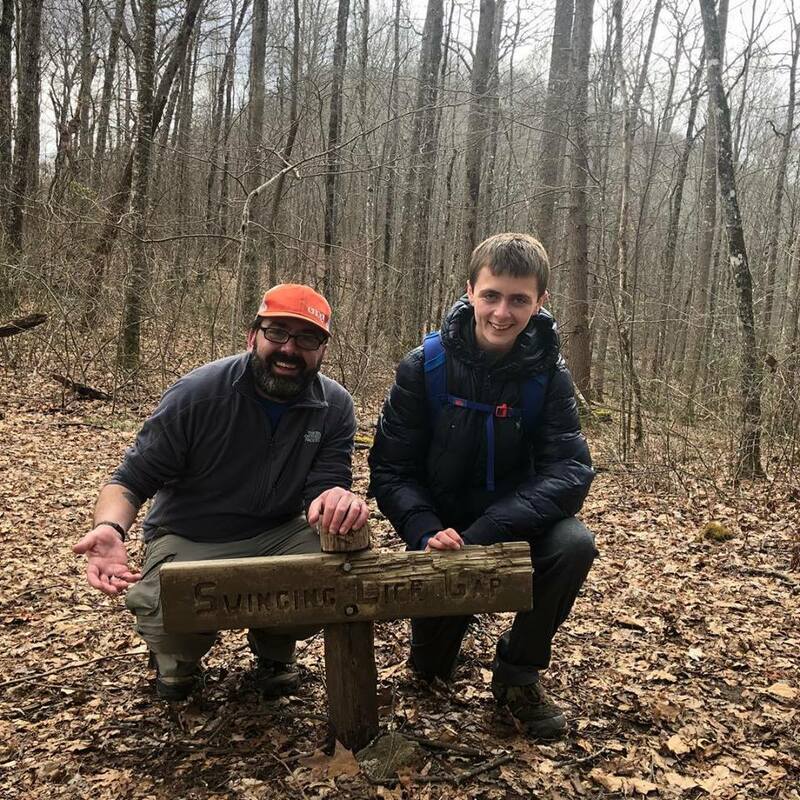 While in the Asheville area I also got to meet in person a thru-hiker from the class of 2018 that we enjoyed following on YouTube – IBTAT. 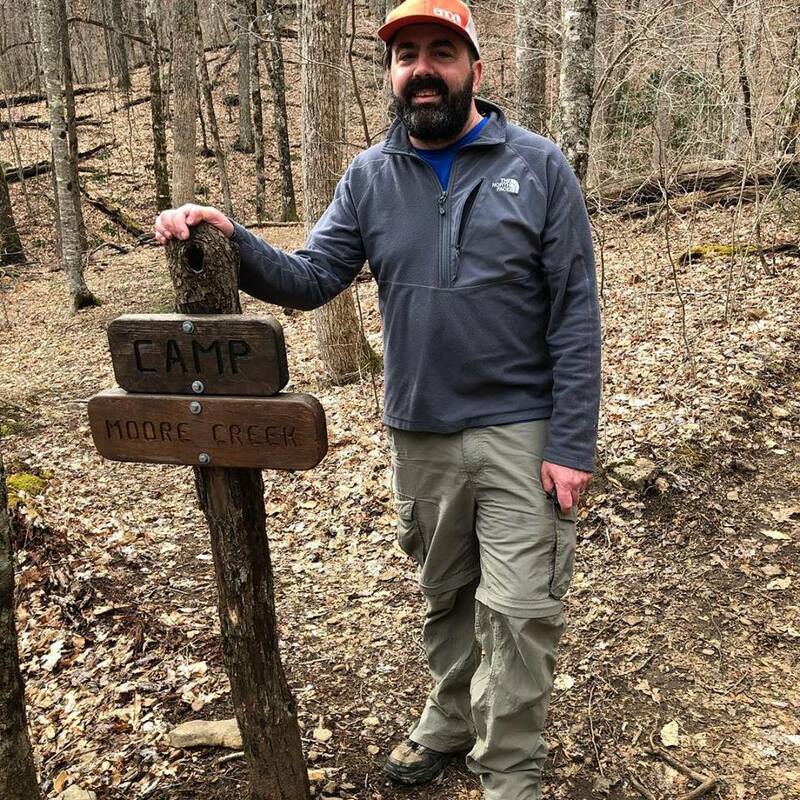 While he’s quite a character, speaking often with regular profanity, he’s a really nice guy who found sobriety through hiking the trail and fully appreciates the beauty of the A.T. 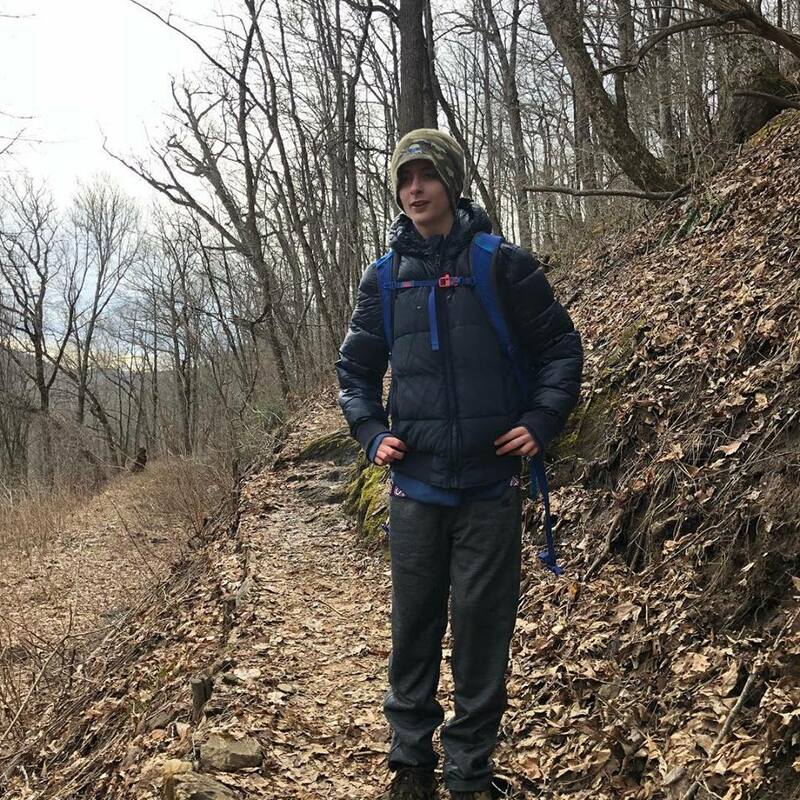 Unlike a large percentage of thru-hikers who are often moving very fast to do the trail as quickly as possible (or treating it like a giant party), he often stopped to observe and point out amazing views and how lucky he was to be able to experience a thru-hike. He’s gearing up for a PCT hike soon. I knew he lived in Asheville and cooked at a restaurant there, and so I reached out to see if he would be working that day we were arriving in town. When he confirmed he was, we went for an amazing breakfast and a quick hello. Because he had thru-hiked last year I was hoping to have him meet my son too but the schedules did not line up. For the hike we opted to go back to Franklin, an area I knew a bit now from our last visit and hike to Siler Bald in September. 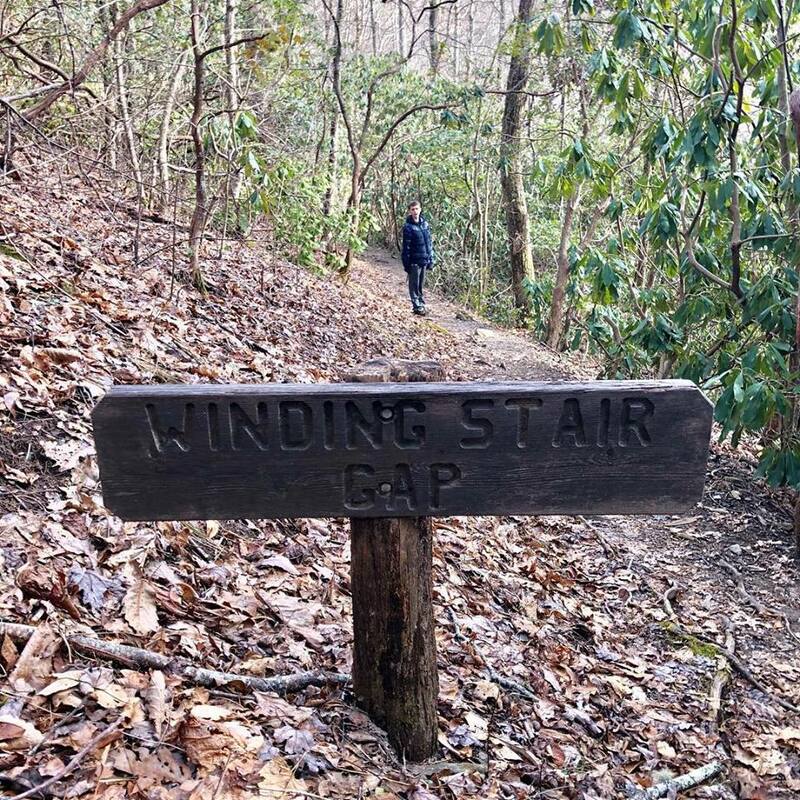 I considered a hike up to Wesser Bald from Tellico Gap, or Wayah gap to Wayah Fire Tower, or from Winding Stair Gap all the way to Siler Bald, but all were too long and too much elevation gain for the number of hours we had to spare. We opted for the last hike, but only halfway to Siler Bald, stopping at an overlook two miles up at Panther Gap. While not a 360 degree view, it too had great views south from east to west and as I mentioned we’ve already been up to Siler Bald. 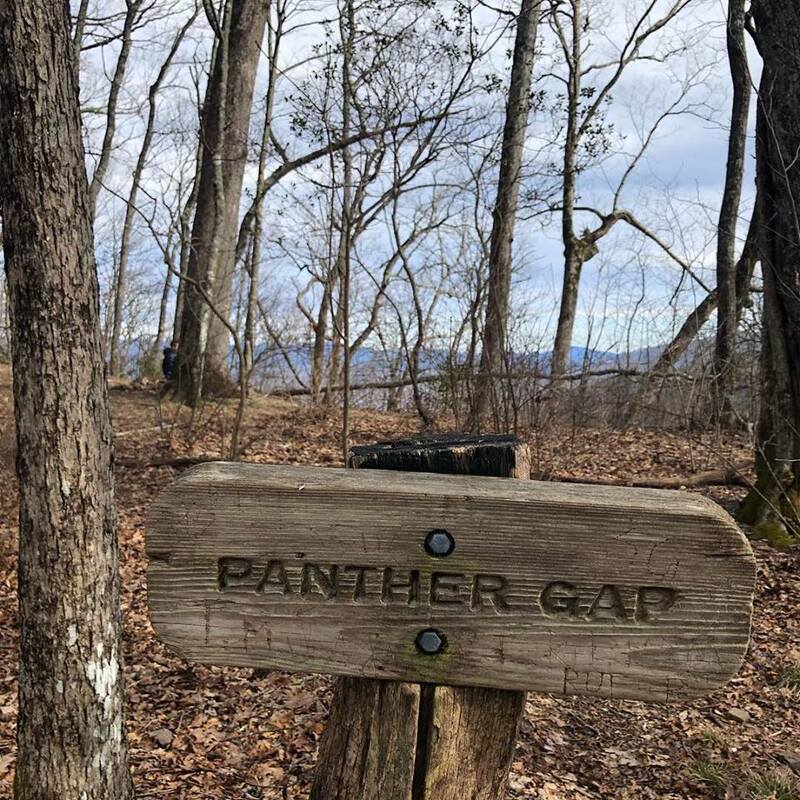 We will cover the two miles between Panther Gap and Siler Bald when we thru hike – or at the very least do a long-a** section hike (LASH) in a few years. My son’s not sure he can do it, but he wants to try and we will give it our best shot. Even a week together on the trail will be an amazing bonding experience we would cherish for life. The climb out of Winding Stair Gap featured an exciting rushing brook crossing, some good twisting, climbing trail with lots of log steps (hence the name) and a beautiful cascade with a bridge across it. Up to Panther Gap the elevation gain was only about 850 ft, but we felt it. There were two steady climbs with a merciful half-mile of flat to gradual uphill in the middle. There was a gorgeous campsite about a mile up at Moore Creek, and oh how I wished we had overnight gear and were spending the night. We stopped a short ways after at the sign for Swinging Lick Gap, which someone had tried to change into a more vulgar name by carving the L into a D. My son got a kick out of this of course. Me being a trail maintainer, not so much. I hear they have to replace this sign often. While it’s a funny name, vandalism isn’t funny. There was also a camping spot at Panther Gap, which we saw when we finally caught up to Jiffy Pop who was waiting patiently for us at the view. For someone worried about being able to do it, he certainly left us way behind on the climb up! There was a fire pit which had some orange peels in it. Being a ridge runner and an all around leave no trace guy, I cleaned those up. It’s a reflex, and the right thing to do anyway. I imagine in summer in full canopy this view would be much more obscured but it was great this day. The wind was howling over the ridgeline at the gap. The wind always finds the path of least resistance and a gap sure qualifies. We were at about 4500ft in elevation at this point and I tried to identify the other peaks in the distance as some I knew were along the trail south of here. We had a snack and took in the long views and took some photos and then headed back down as we had to be back at the car in 45 minutes. The rhododendron and mountain laurel were plentiful, and I pictured the glory of this section in full bloom. It was beautiful even in winter. And, my son did get to meet two thru-hikers on the hike, so that was great. I really wanted him to meet some thru-hikers so he could be inspired by them as well. They were a gentlemen from Ohio now living in Franklin who did the trail in 2015. And a current thru-hiker “Engineer” now “Full Monty”. He said had to take a break in Franklin due to IT band issues for many days but was back out and at it, and optimistic for a great hike. I too have some knee issues and wear compression sleeves for downhills, so I can relate. 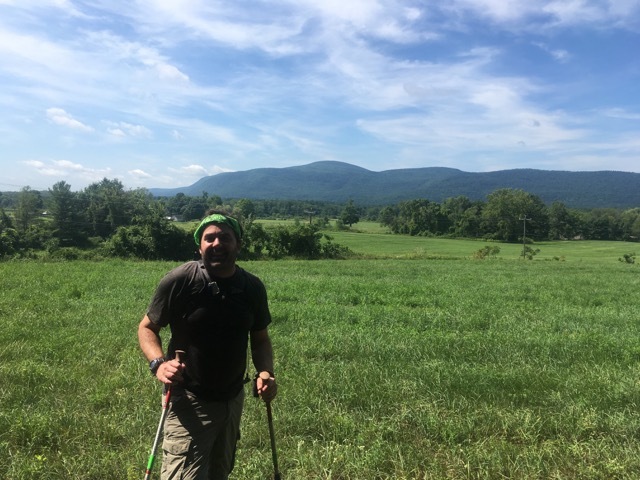 Over the weekend we did get back up to the trail in Massachusetts, but opted for the shorter section to the VT border from North Adams instead of south from there over the Greylock range. We did it as an out-and-back and did not venture further into Vermont as the Green mountain club requested people not hike the muddy trail until after Memorial day. Doing this section turned out to be a wise decision on many fronts. But most of all, the all-day heavy rain combined with cold temperatures predicted for Saturday did come, just minutes after we got off trail in the morning. We lucked out with nice weather Friday so the climb up the Pine Cobble wasn’t too sketchy and the view from the top was grand. This was the longest and highest uphill we’ve done together, gaining about 1800’ from North Adams to the Vermont and Long Trail border. We felt it the rest of the weekend in our legs. We had a bit of excitement on the hike! One of the hikers at the campground called in for a midnight rescue as he was having abdominal pains, and so we met some EMT’s and firefighters who had to hike the 1.8 miles uphill to the campsite in the middle of the night and direct them to the bear box to get the hiker’s food. I was treated to a view of the bright starry night as I was out there chatting with them… and many Barred owl calls… Also my fellow weekend ridgerunner from CT AMC came up to the campsite at 7am to meet us for coffee before his daughter’s lacrosse tournament in nearby Williamstown that day, so that was cool. And I got 2 nasty black fly bites. Those little bastards got me at the end of the day when I was tired and filling up water and rolled up my sleeves where I had no bug juice on…. Duh! They still itch and hurt so much I’m putting on cortisone regularly. I was warned about May in Massachusetts! We saw only about 3 other hikers on the trip, including two girls staying at our campsite. 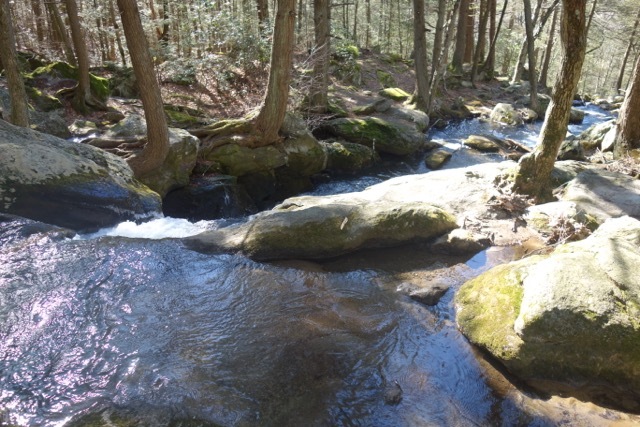 It’s a really pretty walk along Sherman brook for the first few miles up out of North Adams. On a really hot day that would be paradise. I trekked it the extra mile south from Rt 2 on the way out Saturday morning to Pattison road. This way we could start there next time and not have to park in town and have a steamy concrete road walk before the long climb up the Greylock range. After we got off the trail we spent the rest of the weekend exploring North Adams and Williamstown. We will come back to do the last 13 miles of the A.T. in Massachusetts in a month or two. It will still be there. Besides, then we get to enjoy the Bascom lodge…. 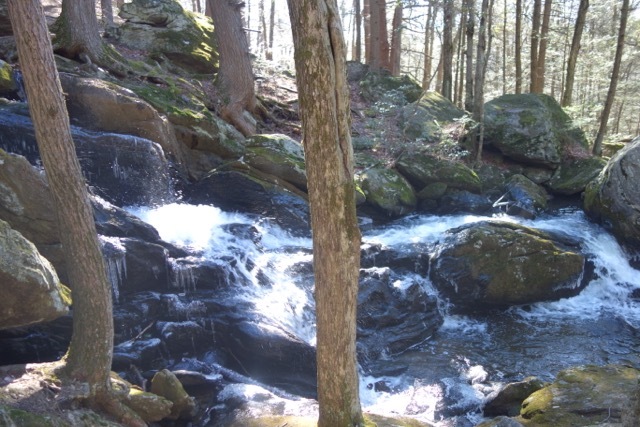 I start ridgerunning in Connecticut this weekend over Memorial day, and then Fielden Stream and I are doing another New Jersey section in about 3 weeks with our Pennsylvania friends. Last weekend Fielden Stream and I did another overnighter in Massachusetts. We did all of section 5 and about 1/3 of section 4, as we traversed the eastern flank of October Mountain State forest. Once again the cookie lady shuttled us, up from Lee to near the Dalton line on Blotz rd. The first day we did 5.4 to October Mountain shelter. We stayed with a great group of thru and section hikers and the rain held off until bed time. There was lots of mud so I dubbed the area “Mud-se-chusetts”. The next day we did 7.2 back to our car in Lee. There weren’t many views but it was nice and cooler in the morning and in the shade of the dense forest here. Red efts (salamanders) were out in force as were the indian pipe plants. We did pass one pond which was tempting to dip in but a big lunch and a beer in town was more tempting, so we pushed on. We summitted 3 peaks on day 2: Bald Top, Walling Mountain and Beckett Mountain. With the exception of Walling Mountain, both were much easier summits from the north. Bald top was the only one with a semi-view but it was no longer bald and mostly grown in. 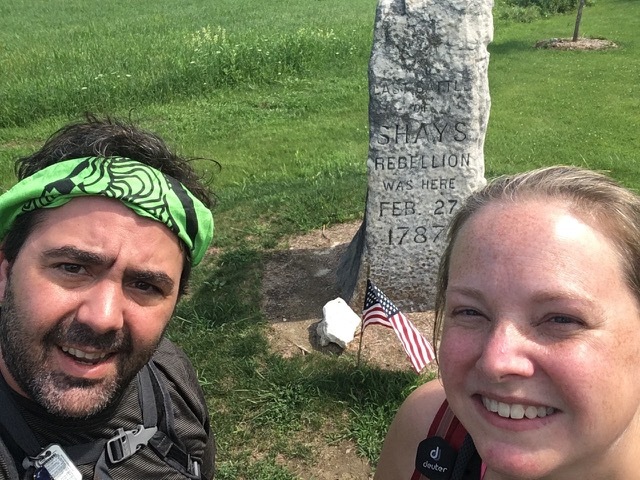 As we reached the end in Lee, we ran into two hikers I met when ridgerunning in Connecticut last weekend which was cool! This is the last section we will do southbound in Massachusetts. I have one more ridgerunner weekend in Connecticut over Labor day, then we start New Jersey with friends the following weekend. Then Fielden and I will do a day hike in Massachusetts with some other friends who have a house up there, and complete section 4 into Dalton with them. (We saved the section 4 view for that hike). In October we will do the next section north in Cheshire to the bottom of Mt. Greylock. After that, it’s back to Jersey unless we have a very unseasonably warm weekend in early November. But even if so we will probably save the last 17 miles of Massachusetts for a 2 nighter in late spring early summer 2018 and do more of Jersey as it will be about 10-15 degrees warmer. The Red Efts were everywhere! This past weekend was another glorious one out on the trail. The weather was perfect for one thing. Never got too hot or humid, it was about 60 and dry and breezy at night, about 79-81 during the day. I hiked with my new ridgerunner friend again on Saturday and two of my friends from the AMC also joined me to hike on Sunday (one overnighted at Algo too) and we met lots and lots of great hikers. We found one thru hiker’s tent that dropped from his pack and reunited him with it, cut a blowdown, saw a few lizards, a scarlet tanager and a garter snake. I didn’t see but smelled (I’m sure of it!) rattlers in two spots on a mountain famous for rattlesnakes and almost convinced my friends to re-name me snake-smeller. I sadly saw the extent of the recent fire damage on the mountain, and got to push myself through one of the toughest sections of the whole state, twice. My friend from the Bull’s Bridge task force treated me to some BBQ when we got off trail, and I got to dip my sore feet in the Housatonic at the end of the hike. I’m off for the next few weeks for a few family-scheduled events but will be back on trail in the beginning of August. I hope you’re not minding the new short format too much; I will try and write longer entries from time to time when such luxuries are available! This section was shorter than last weekend but much more strenuous as a whole. Linus and Brian on the state line! Well, you’ve probably figured out by now that we didn’t go backpacking in New York this weekend. The heat indexes were over 100 degrees for both days, and heavy rain and thunderstorms were predicted. And even if only a 40% chance, if we were having our usual luck, we’d be right under it. And based on the storm we experienced the previous weekend on our way out of the area, and what we were treated to in Massachusetts Friday night and here in Connecticut last night, any storm that did roll through would have been epic. Hiking out safely would have also meant bypassing Eastern Pinnacles and Cat Rocks, which were both highlights we wanted to experience. Sure we coulda taken the chance and toughed it out but being section hikers we have the luxury of picking when and where we go and adapting as necessary. We don’t mind the rain, we’ve toughed it out many times through the storms. But really the heat was the concern. We had 3 mountains to climb, 7 miles of trail, and full packs to carry through all of that. That might not seem like much distance but the climbs added up to several thousand feet elevation and a lot of exertion. We were seriously concerned about heat exhaustion or worse. I am sure even thru-hikers were zeroing on one of these days or doing a nero (near-zero). 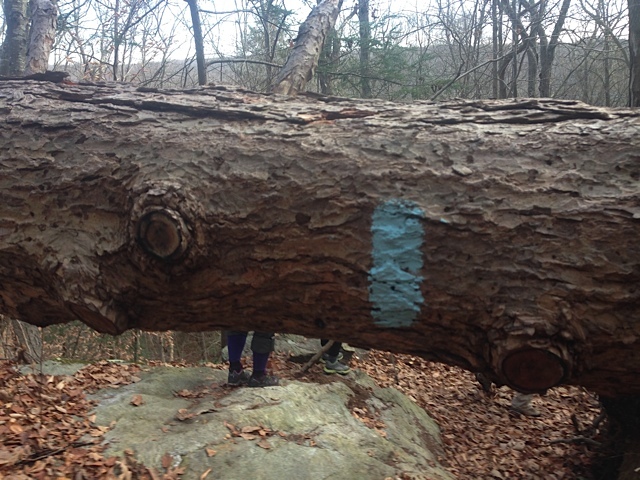 But I still had the day off, and we still wanted to hike, so we modified it a bit. While trying to finish New York, we’ve also started Massachusetts. We did the first 14 miles and change with our friends from Miami in June. That was a great and challenging trip for all of us, and in the process I thought the following section might be a good one to do with the kids later this summer or early fall. Based on the ongoing heatwave, we’re pushing that back to a fall weekend. But I also thought maybe a shorter mileage trip would be a better experience for all. Jiffy pop has done one overnight trip, which was about 7 miles, and Ratchet hasn’t backpacked yet. So I decided we’d do a couple miles in between these sections as a day hike so that the distance is right for the trip with the kids. So we did a 5-mile section continuing northbound from the Shay’s Rebellion site to Homes road, atop June mountain. The first 4 miles were mostly flat through the valley with the exception of climbing the shoulder of Vossberg Hill. Only at the end was a real climb, a steep 600 foot climb in little less than a mile. I got to test some new gear, which always makes me happy, and honestly its better doing that on a day hike because if you find out something’s not working out, you’re a lot better off. 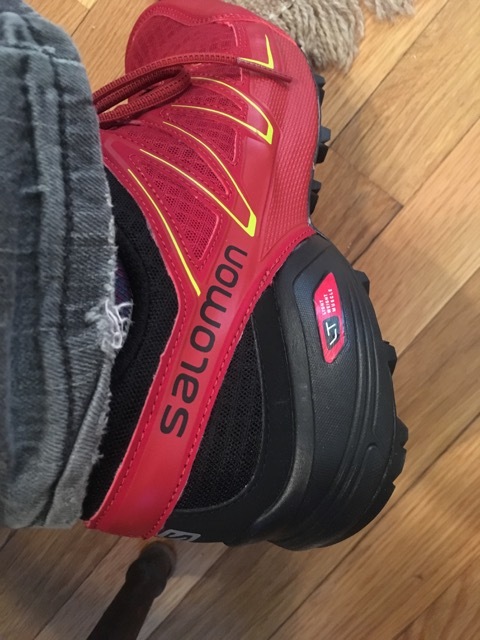 I got my new Solomon trail runners (last season’s Vario Speedcross 3 on closeout for half price!) delivered the day before, and also picked up a merino SmartWool short sleeve shirt and some low socks recommended for trail runners at a stop into REI the night before. The trail runners and socks felt great in my house, and I know the merino works great in weather like this to wick sweat and maintain comfort. But the trail is always the real test. I was excited to get up to the top of the mountain to drop off the first car and head down to South Egremont road where the monument is. Even though it was over 90 degrees already, that forecast was about ten degrees less than New York. That’s the other reason we chose Massachusetts. We got photos and videos this time of Shay’s Rebellion monument, which has now been righted from its tilting pose. We were so tired at the end of the last section hike here we just threw our packs in the car and raced to the comfort of our hotel! But I was glad to have brought my friends on that hike, and for my family to see the monument last fall. We headed through the first of many meadows, scorching in the heat, the sweat already dripping profusely. We love finding and identifying wildflowers and there was no shortage here. Not to mention cornfields — lots and lots of cornfields. We passed one southbound backpacker in the meadow but didn’t really stop to chat – too hot in this spot! 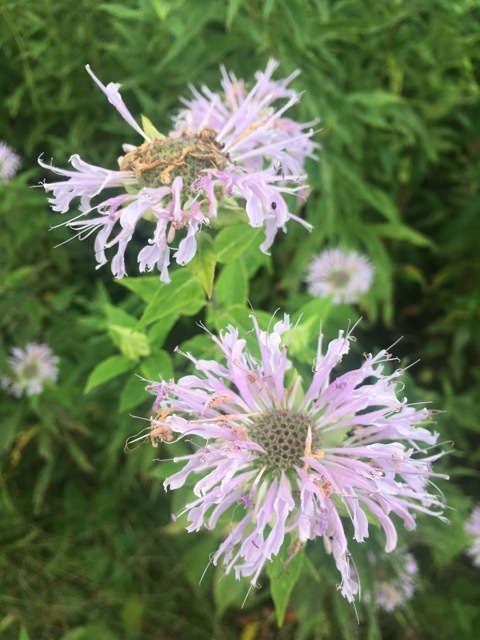 We saw lots of Chicory, Queen Anne’s Lace, Goldenrod, Morning Glory, and a few others — I believe Wild Onion flower and Butter and Eggs (that one was confirmed). Vossberg hill treated us to a short respite in the woods though a decent little ascent, then it was back into fields and one hemlock stand where we crossed a bridge over a swamp, and found a turtle along the trail. 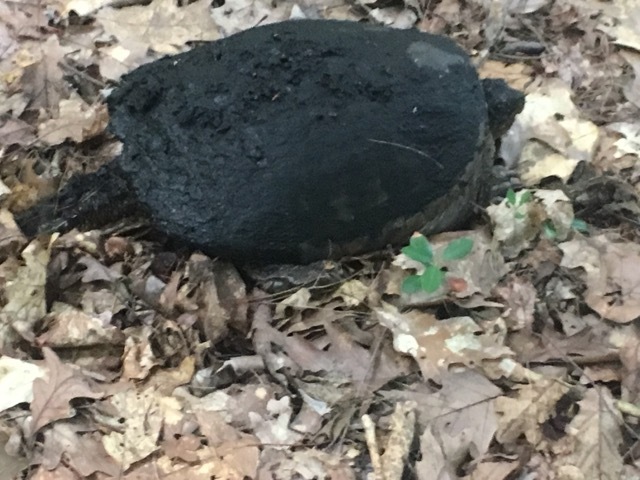 We were certain he was burned, but realized later that he just had mud on his shell, probably to keep cool, or that he just crawled out of the swamp. We then crossed over train tracks, and through one more meadow alongside a pond, and ran across the busy route 7. This was fun because every time we drive by here I point out the trail crossing (natch!) and now I’ve finally hiked it. We ran into several more backpackers just after route 7 and chatted with them briefly in the shade. Some were Nobo thrus and the others were Sobos. They too had been chatting and the Nobos had just done a resupply in town and were fully loaded heading out up into the mountains. I felt kinda bad they were carrying that weight in this heat, but reminded myself that they were much more accustomed to this 1,600 miles in. 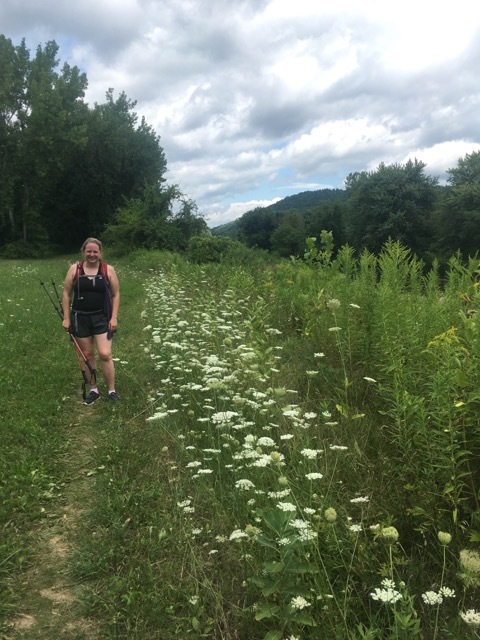 We went through a few more meadows of cornfields and wildflowers parallel to the Housatonic River. The river looked so refreshing, we wanted to jump in. We crossed it on a road bridge and then walked through a few more meadows and cornfields before heading into the woods for the final climb. A nice man in an old antique truck with his dog waved to us as we crossed the final road before the ascent, and suddenly we were in the forest again for the rest of the hike. The mountain climbs about 700 feet up its side very quickly. We had to stop several times to catch our breath. But it was a great test of my new trail runners and shirt, which all performed perfectly. And even though it was stupid hot out and we were climbing a mountain, it was still cooler in the trees. We finally reached the summit of June mountain, which did not have a view. Those are on the ledges just north of here on East Mountain, which we may do with the kids in a month or so. I gotta do some research and make sure it’s not too hairy. We beat the eruption of rain by about an hour and watched it roll in from our motel in Great Barrington. A favorite town of ours, we enjoyed some local art shops, had a beer and apps from Barrington brewery, and dinner at a great Greek restaurant. The next morning we headed home and picked up a few items for the new house. It was even hotter that day, and we were glad to have creature comforts, even though I already missed the trail. Watch the video of this hike here, and the first part of Massachusetts here. 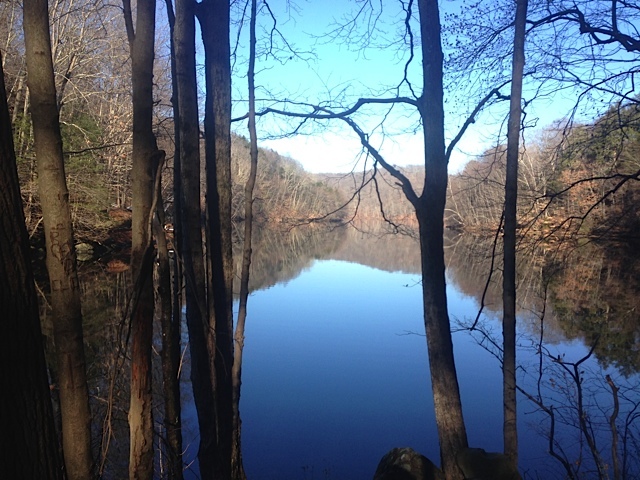 While I sit here lamenting a hike-less weekend, I look forward to our first Appalachian Trail section-hike of the season on Friday and want to share some of the beautiful scenery I saw on the most recent hike. 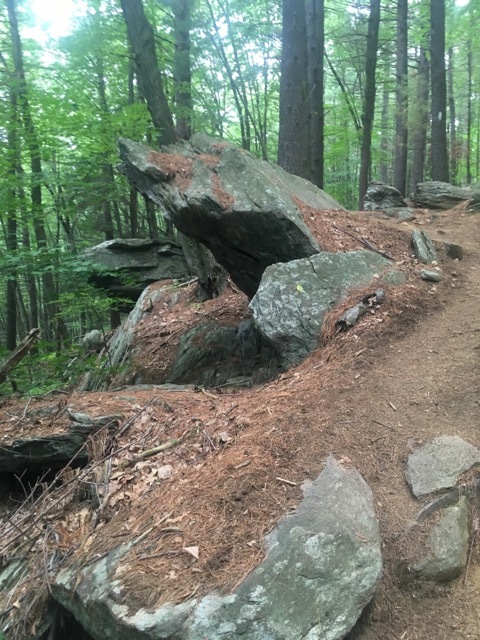 Last weekend I decided to do part of a different trail. There was an AMC-led hike and it was on a section of the Mattatuck trail I have not yet tromped on. This trail as a whole is not fully complete in the sense that there are many gaps between completed / blazed sections. I am sure they eventually hope to connect it all but I am guessing there are private land issues that prevent that at the moment. 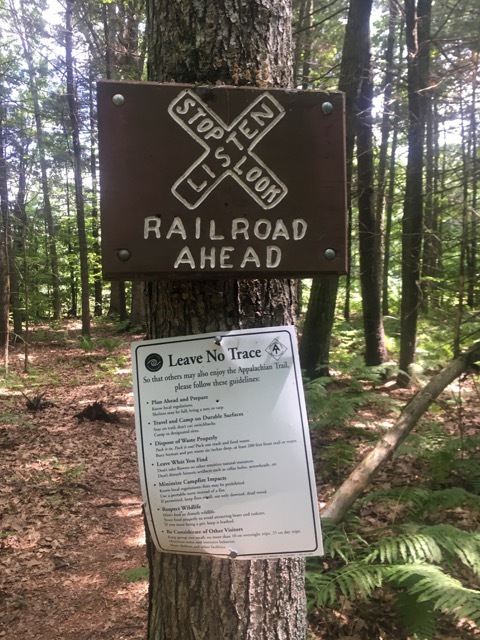 The trail starts in Wolcott, about four and a half miles south of Buttermilk Falls, and ends at its intersection with the Mohawk trail in Cornwall on top of the Mohawk ski resort. 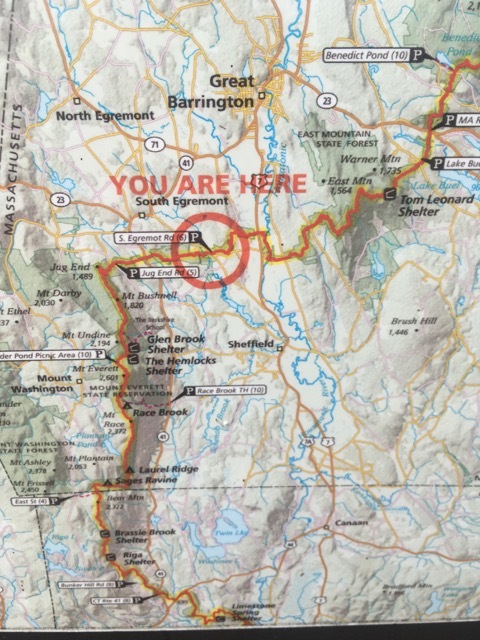 We passed this northern terminus a few years back when hiking that trail with my son “Jiffy Pop.” Altogether it is 36 miles long and traverses nine towns and some of the state’s highest peaks. It also goes through the White Memorial Foundation and Conservation center, where I will be doing my wilderness first aid training weekend at the end of April. There’s a great section of the trail west of here with a massive cave that was once part of the famous Leatherman’s route, and the top of the cave is a formation known as the Crane’s lookout. I did that a few years ago as well with Fielden Stream on a day hike and then had quite an adventure as I had decided to explore a bit further than her that day, and they were working on a re-route which caused me to miss my turn back to the parking lot. Luckily since she had finished the hike at the park headquarters, she met me farther up the road when I was able to connect to it via another side path. We made it just in the nick of time as a dense fog and dusk were setting in. Hopefully they have sorted that all out by now. I definitely recommend checking out the cave and lookout which are in the eastern part of Black Rock State Park. You can park at the headquarters and its about a mile east to those great formations. On this hike we did an out-and-back to the west from the parking area on Todd Hollow road and then another to the east, for a total of about 8.25 miles. This also included a short side path to a beaver pond. Our leader Tom pointed out that this was really the nicest scenery along this portion of trail. It did include some road walking but there was a lot of beauty in between, including multiple groves of mountain laurel and small cascading streams through the Mattatuck State Forest. This time of year water is flowing abundantly from snow melt. Because of all the laurel it also reminded me of the Housatonic State Forest sections of the Appalachian Trail in Cornwall, and I’m sure its just as beautiful here in the summer. I brought my microspikes but did not end up needing to take them out of my pack. Though I feel it was smart to have them as the roadway where we started was very icy and the trail very well could have been the same or worse. 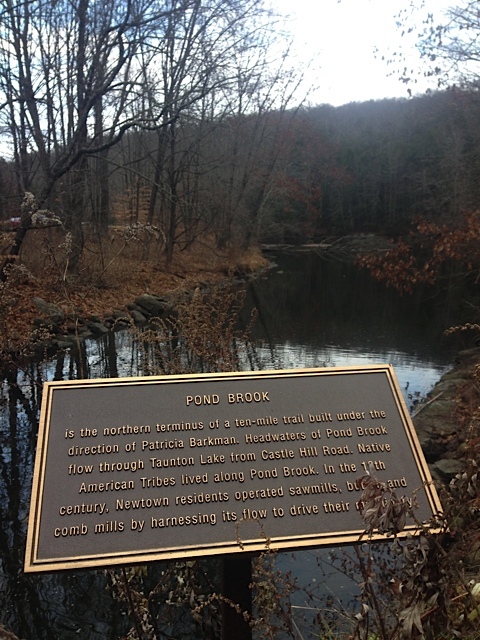 The first portion was just over a mile to the banks of Brophy pond, though a good uphill climb. I always find it interesting when climbing up to a body of water. 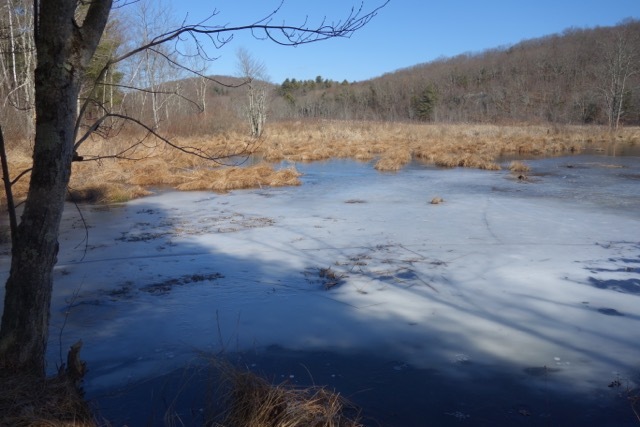 The small beaver pond was just before the climb, and both ponds provided some nice views across the water. 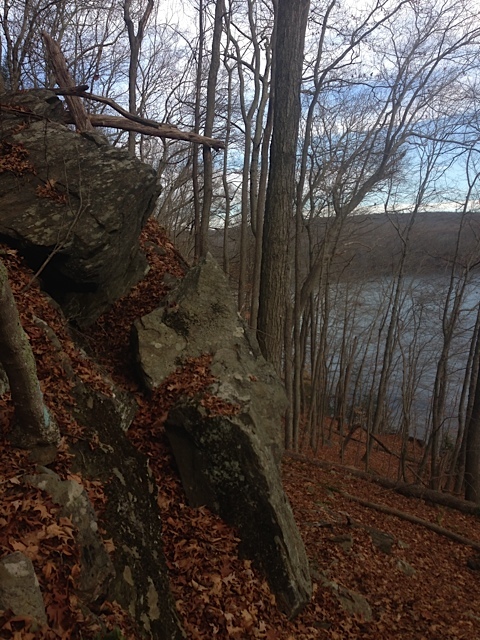 The Brophy Pond viewpoint had a nice little rock outcropping along the bank and is definitely a nice picnic spot. Whenever I head back to finish the section from here to Black Rock State Park in the future, I will lunch here! There were a few spots on this section of trail where the trees were also marked with red and white bands, which is apparently indicates the boundary of Army Corps of Engineers land. We then turned around and headed back past where we started and continued east on the trail along a gated older portion of Todd Hollow road in Hancock Brook Park before entering the woods at a glacial erratic known as Ed’s Big Pebble. Here is where the trail climbed through the many laurel groves and over several small streams and waterfalls past a large rock outcropping that likely provided shelter for Native Americans long ago. Its multiple overhangs and nooks would have provided adequate protection from the elements. It certainly made for a nice lunch and photo spot! 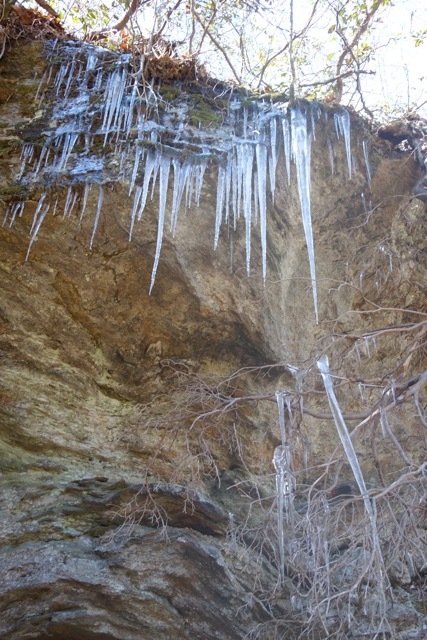 Large icicles hung threateningly from its upper rim, making for some dramatic photos. The trail then continued through some pine and hemlock groves, thickening with mud along its route. There was then a short winding road walk over a railroad bed before heading back into the woods a short distance to the incredible Buttermilk Falls, which is maintained by the Nature Conservancy. I had no idea they would be so incredible. 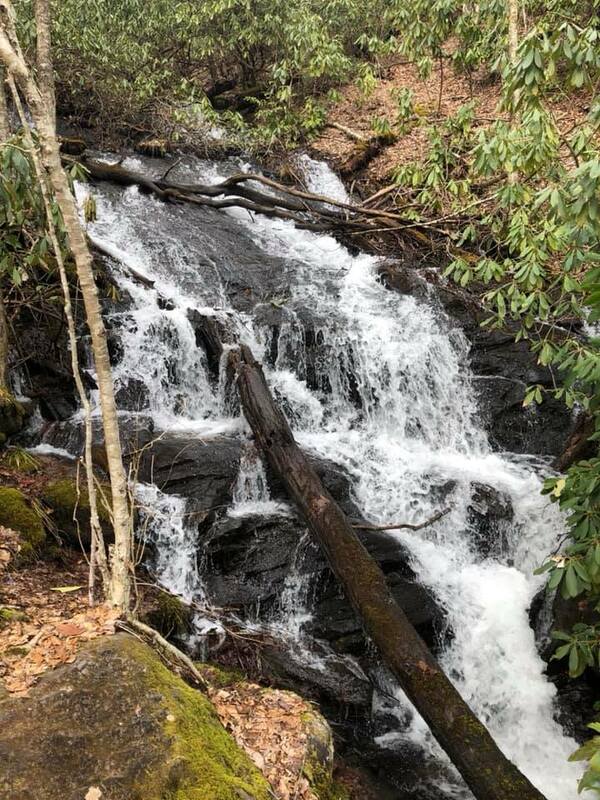 It reminded me a little of Sages Ravine, as the trail wound through boulders along the edge of the multiple cascades. It was flowing thunderously down the ledges into the ravine below the trail, and we all sat in awe and took photos. Such a dramatic waterfall was even more unexpected because it was just a quarter mile in from the road, if that. I will be bringing my family back here for a visit, as its easily accessible for all abilities. Upon reaching the crest of the hill that framed the falls, we turned back and retraced our route back to the cars. 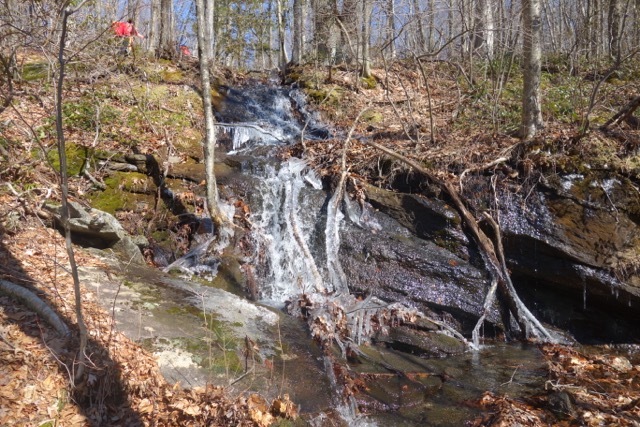 This hike provided an opportunity to take in some stunning late-winter scenery, waterfalls, multiple types of forest, and massive boulders. And it was also one of my longer hikes recently, so a nice way to build up to longer portions I have planned for the summer. The last time I did over 8 miles was in November on a trail patrol walk on the A.T. in Sherman. Last night I also tested two new sleeping pads from Therm-A-Rest, in my quest to find the one best for my active sleeping habits! While not in a tent, the hardwood floor provided an adequate comparison to sleeping on the ground. I have not had much luck with inflatables as you may know from reading my blog. The first one I bought for next to nothing at an REI garage sale knowing it had a tiny leak and just needs patching. It loses air very slowly during the night, and was a good first pad investment to see if I was going to do this regularly. I will get around to fixing it but since this is something I certainly do all season now, I needed one that would stay inflated and retain its insulating qualities until I could fix that one. The second I am hoping was just a dud because it broke on the first night and comes from a very reputable brand. 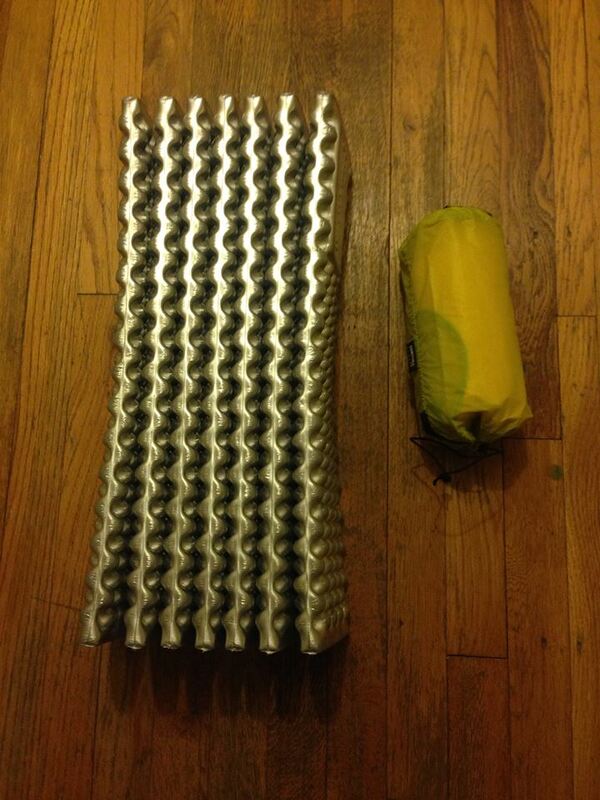 I returned that one and recently managed to pick up the Therm-A-Rest Neo Air Trekker on the cheap in an online sale. So I compared that to their foam Z-Lite model last night by sleeping on each for several hours. I bought one for Jiffy Pop’s first backpacking trip last year so I thought I’d see how I liked it. The foam has several advantages, and is my go-to if this inflatable doesn’t hold up. It also makes a nice seat on hike breaks when nature doesn’t provide a good flat rock or fallen log. In fact they make a smaller ‘seat’ version of this pad for that reason. And it’s got a nice R-value rating due to its coating. Some other advantages are you can pick one up for about $40 and can easily cut off a few panels if you’re shorter or to keep just your upper two-thirds cozy and warm and have it take up less space. It’s also very light. But the profile of these inflatables is so much more compact and I was spoiled starting off with the first one, even if it had a small leak. So I wanted to give them one more try, but this time in an environment where another failure wouldn’t mean sleeping on the cold ground! I really liked this pad, even though it’s a little narrow. While it does have a bit of that ‘potato-chip’ crinkling sound, in my experience all inflatables have some sort of sound based on what material they are made of. Foam would be the only ones that don’t. I’ll have to see how much it keeps me and Fielden Stream awake on an overnight to see if it’s something I can use with her. The R-value on this pad is also a bit lower than my other inflatables, so that would be a factor to consider on colder hikes, but I do have a new lower-rated downtek bag that would hopefully compensate for that difference. I am happy to say it held up last night so its future is secure for now! Saturday I got back out on the trails for a much needed hike. Two weeks in my insanely hectic life is more than enough time to leave me dying for some nature therapy! I also had to work over the weekend and attend a late night party in NYC for my friend’s birthday – all the more reason for me to make sure I got out there to keep balanced. My wife was wonderful to give me so much time to myself last weekend as she too is feeling the stress of crazy schedules, so I’m sending her to hang out with her sister this weekend for some fun of her own. And I am glad we got to do the last hike together as it had been awhile. I am really missing our backpacking trips already and spring is too far away. Although thanks to El Nino, the east coast has been experiencing late spring conditions and last Saturday and Sunday both had highs in the 60s and lows in the upper 40s. For this reason I had briefly considered an overnight backpacking trip but ultimately decided against it. That would mean skipping my friend’s birthday, and anyway hiker midnight at 430pm would make for a very long dark night… However had my wife been able to join things might have been different. But this one I had to do as a day hike. This time I opted for something other than the A.T. and skimmed through the weekend hike offerings from my AMC club. I had originally settled on a group hike on the challenging northern end of the Mohawk trail (once the A.T.’s route). But distance from home and a late start to the hike meant I’d have barely enough time to change my clothes, kiss my wife and kids and rush to the train station if I wanted to make the party in time. Another of their group hike options was with Tom, who I’ve done several hikes with including the trail work at West Rock a few weeks ago. It was a circuit hike on the Lillinonah trail and was only 45 minutes away. 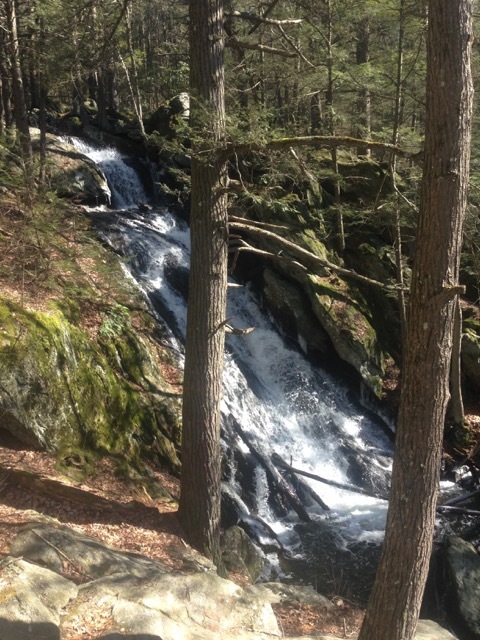 The trail is in the Upper Paugussett State Forest, in Newtown, CT. and is about 6 miles long. This choice also meant I got to check a full trail off my completed list! 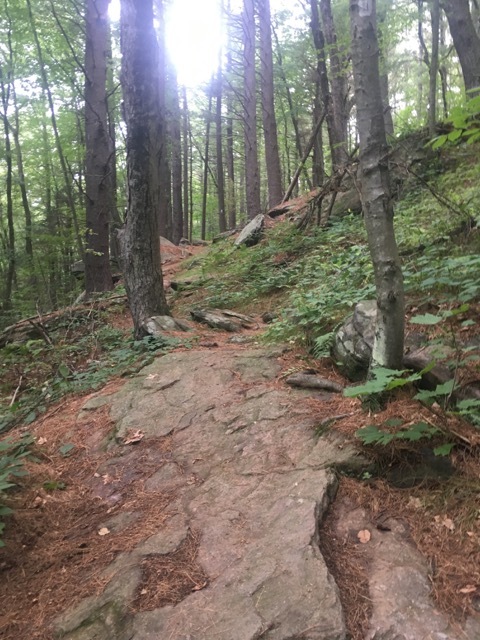 I pulled the map for the trail out of my Connecticut Walk Book from the CFPA (Connecticut Forest and Parks Association) and gave it a quick study. It’s always good to have your own copy and be somewhat familiar with the layout should you get separated from the leader. These books cover all of the trails in our state, now adding up to over 800 miles and filling two volumes. The original blue-blazed trails added up to about 400 miles and one book. There is another hiking group I do outings with who are actually called the Connecticut 400, and coincidentally, they were out doing the same hike that day and starting just a few minutes earlier. The trail begins by skirting Pond Brook from the boat launch and then makes a good climb over the first high point to the edge of Lake Lillinonah, which it then follows along a ‘scenic area’ for just over 3 miles before going back into the woods for one more big climb and descent. The scenic area is closed from December 15 to April 15 to let local families of Bald eagles nest, so that may explain why there were a few groups out on this December day. Lake Lillinonah is actually part of the Housatonic River that was created in 1955 by the Shepaug dam, which we saw from our lunch spot along the lakeside. It’s the second largest lake in the state after Candlewood lake. There were many boaters out on this day, and a few of the hikers in our group also enjoy kayaking and fishing there. Swimming here is discouraged due to heavy boat traffic. There are a lot of ups and downs on the trail, even if the elevations aren’t that high. All in all there was about 1,100 feet of elevation gain, so it was enough of a work out. While I enjoy a flat trail over an office any day, I like challenging myself, and staying in shape especially for those longer hikes I want to have the stamina for. I definitely felt like I got a good workout, and we added about another half mile to the distance by taking a side excursion to a nice lunch spot overlooking the dam. While I don’t know if its legally permitted, there were some great camping spots along the lake edge by the trail, and signs that said ‘no fires’, so I’m assuming hunters and fishermen frequently camp there. We did see a hunter out that day, and one of the campsites had a fire ring or two with actual abandoned cooking grills and what looked like an old platform of some sort. There is an official camping area with charcoal grills by the boat launch. One really interesting sight was a network of what must amount to miles and miles of blue tubes that were hooked up to and around many trees in the area. 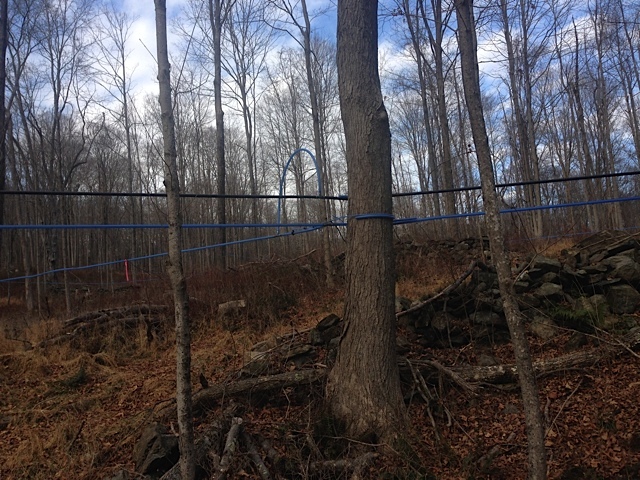 Apparently this is a new system for collecting tree sap; I’m assuming for a maple syrup operation down the road that I passed on the way home. I was surprised about how extensive the system was, and somewhat impressed and intrigued by this new method of transporting the sap. But I have to say it was very visually unattractive. 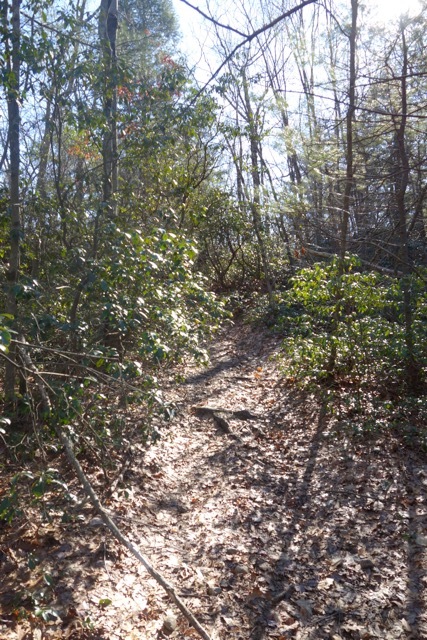 Considering there is a popular hiking trail adjacent to the property that the tube jungle traverses, it’s too bad that it marred the natural landscape. But for all I know this business owns some of the land the trail is on and allows its use as a trail.